Eleven to twelve inches long. Orange brown upper parts, darker wings with two short white bands. White underside with tiny black arrowhead spots in rows stretching front to back. Long downward curved bill. Long twitching tail. Yellow eyes. Inhabits eastern North America, west to the base of the Rocky Mountains, throughout the Great Plains, north into Canada from Alberta to New Brunswick and south to the Gulf States. Runs and hops along the ground. Forages for grasshoppers, crickets, spiders, beetles, ants and other insects on the ground. Also eats a variety of fruit. 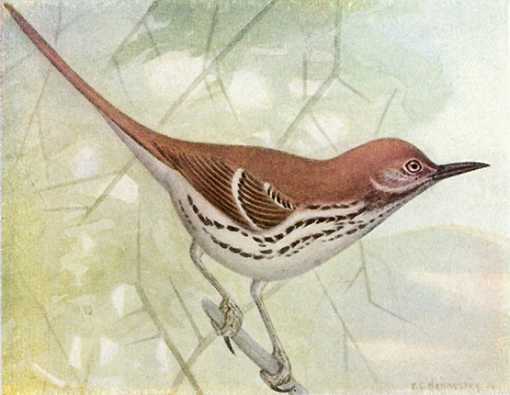 The brown thrasher builds bulky nests of loosely assembled twigs, bark strips, leaves and roots lined with hair and feathers in low trees, bushes, vines, stumps, brush heaps and on the ground. Females lay three to six, usually four or five white eggs, sometimes with a blue green tint. Chances are probably slim of attracting brown thrashers, catbirds and song sparrows to any particular shelf. Another maybe better alternative is something similar to the concave shaped cups made of mesh some have made for blue jays. Attach corners to branches creating a trampoline effect and conceal in a bush. Use a net made from natural cloth material, not metal mesh. 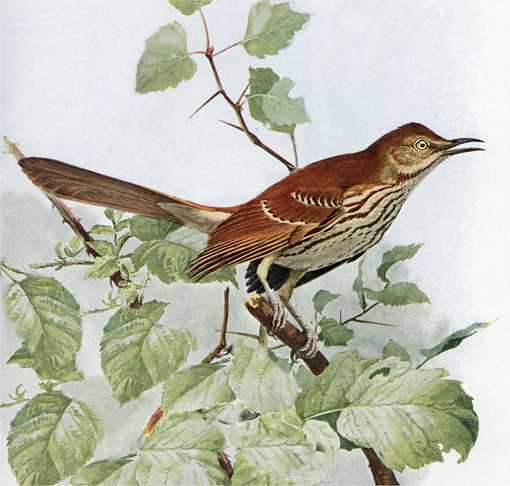 Attract brown thrashers by growing blackberry, buckthorn, black cherry, choke cherry, dogwood, elderberry, wild grape, sour gum, mulberry, pokeberry, raspberry and false spikenard.